DANVILLE -- It was early, early morning in Fresno on October 6. Kate and Emma Tavella and their San Ramon Valley High School teammates were getting ready to compete in the Clovis Invitational at Woodward Park. Their race was scheduled for 7:15 a.m.
"When we had our warmup, we had flashlights," Emma Tavella said. "It was pitch black which I liked because I like night racing." It ended up a perfect morning. 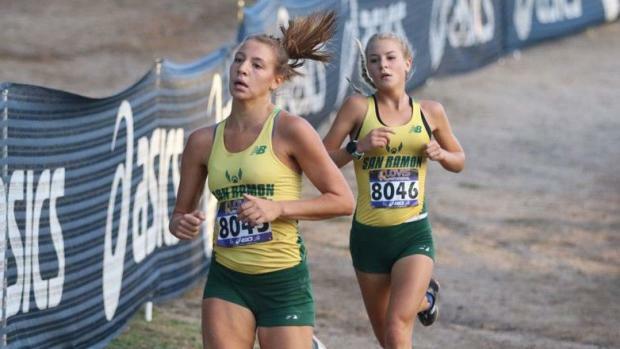 Running on the course where the California Interscholastic Federation Championships are held every November, Kate and Emma broke away from the pack. At the end, Kate Tavella out-kicked her sister, winning in 18 minutes, 14.2 seconds. Emma Tavella finished the five-kilometer course in 18:15.8. "That doesn't typically happen for us," Kate Tavella said. "A lot of times, we are entered in the same races. It doesn't seem that often that it comes down to the end of the race and we're racing against each other. 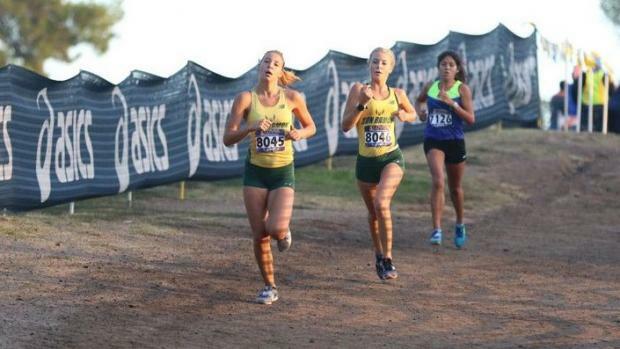 At Clovis, when it came down to the last 100, it was who can sprint down to the finish. It was still different than with another teammate or competitor. "Whenever we get to race each other, it's fun." It was the second consecutive week Kate and Emma went 1-2 at a major invitational. They had done the same the Saturday before at the Stanford Invitational. It has been a very special senior season so far for the sisters. They also went 1-4 at the P-Wilder Mariner Invitational and 2-5 at the Pacific Tigers High School Invitational. Kate has been the top Tavella in each of those but they have switched off over the years. Emma started off the season with an illness and it took her a few weeks to get going. "We kind of go back and forth," Kate said. "Some races, I beat her, some races she beats me. I've definitely seen over the years we've gotten better." As seniors, they are now helping to lead San Ramon Valley into the postseason. That begins Saturday with the East Bay Athletic League meet at Shadow Cliffs Regional Park in Pleasanton. Then, it's the North Coast Section Championships at Hayward High School on November 17, then, hopefully, the CIF State Championships back at Woodward Park on November 24. The Wolves finished second at the NCS Division 2 race last year with Kate taking 14th and Emma 16th. 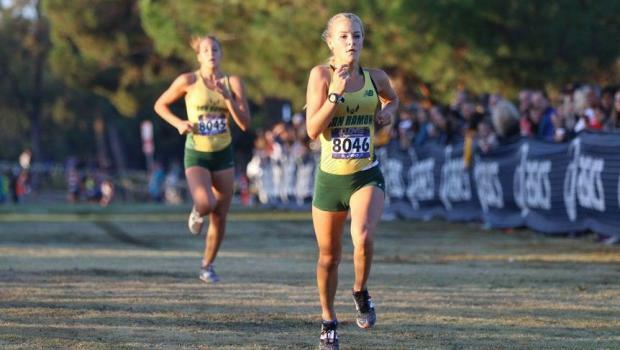 At the CIF meet, Emma finished 37th and Kate 91st as San Ramon Valley took 10th overall. The year before, the Wolves finished eighth in their division at the state meet. The sisters are also looking to make it to the state meet when track season comes around. They have made the NCS Meet of Champions all three seasons, with Kate specializing in the 3,200 meters and Emma in the 1,600. Each has finished fourth in her event once -- one place out of qualifying for the CIF meet -- Emma as a junior, Kate as a sophomore. "My goal is always to improve from last year," Emma Tavella said. "I talk to my coach and ask what the plan is. Try to win it. Try to get in the top. That's been my approach to stick to the front and see what you can do." Kate's approach is similar but just a little bit different -- they are fraternal, not identical twins after all. "I just wanted to come in and get in as good shape as I could and race the people around me," she said. "Going into college, racing people is extremely important. Whomever I'm around, being able to push past them and make moves." They will not necessarily be a package deal in college. Emma recently committed to UCLA. Kate is still considering her options. "I'm definitely looking to make a decision soon but I also know it's an important decision," Kate said. "I'm making sure not to rush anything and making sure that I'm secure in my decision. It's interesting having a twin because our timing is a little bit different." "I don't know if it's just being fraternal," Kate said. "We do the same sport, we have some of the same friends. But we are different. We have different personalities. We are co-dependent but we also are extremely independent. To have each other through all the ups and downs of high school has been awesome, but we've been able to take different classes and have our own path." Said Emma, "I honestly love it because I have a built-in training partner. And I never go anywhere alone I have someone to go with me." But they also do have those twin moments. "We'll walk out in the morning and be wearing the exact same thing," Emma said. "We'll go, 'Really?' "
As for goals, they are to help their team and lower their times. "I would like to break 18 in the 5K," Emma said. "In track, I would like to bring my (1,600) time down to the lower 4:50s." Said Kate, "Bring my (3,200) time down, break five (minutes in the 1,600). My PR (in the 3,200) is 10:46. I think I'm in shape to definitely run in the low 10:30s."